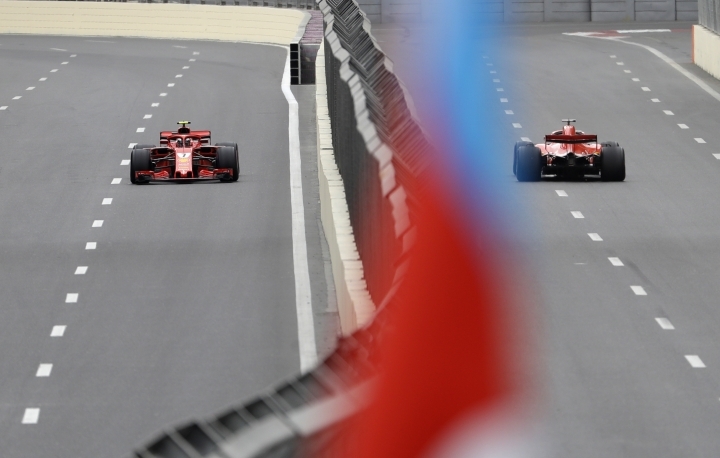 BAKU, Azerbaijan — Sebastian Vettel and Lewis Hamilton will battle again for the win on the Baku streets where their cars hit twice last year. 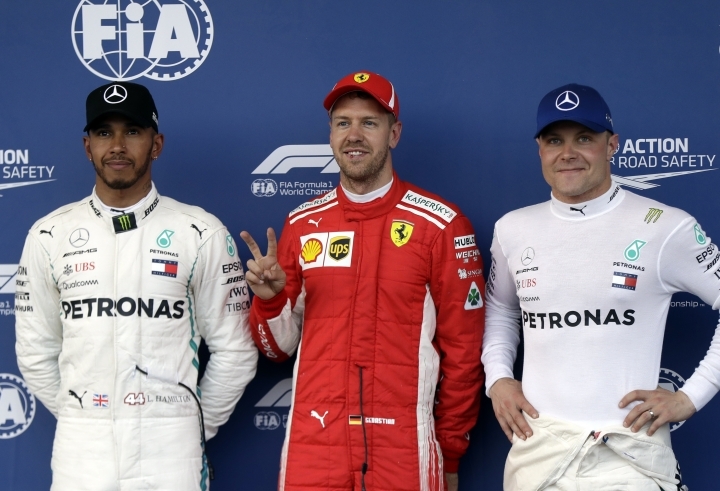 Vettel's storming start in Formula One continued on Saturday at the Azerbaijan Grand Prix with a third consecutive pole position. With him on the front row is Hamilton, who lost out on pole by 0.179 seconds. The cooler, windy conditions in qualifying were mastered by Vettel and Ferrari, who struggled for grip in practice on Friday. "When it clicks, it just keeps coming, and it was really enjoyable," said Vettel, who leads Hamilton by nine points after three races. The German was going even faster on his last lap but made a mistake. But Vettel was reserved about his chances. He also led Hamilton early in last year's standings before Hamilton charged back to take his fourth world title. Baku's tight corners and narrow streets mean any incidents in the race will likely draw out the safety car, and could offer chances for drivers starting farther back. The cooler weather brought by the race's new spring date makes it hard to heat up the tires for maximum grip. 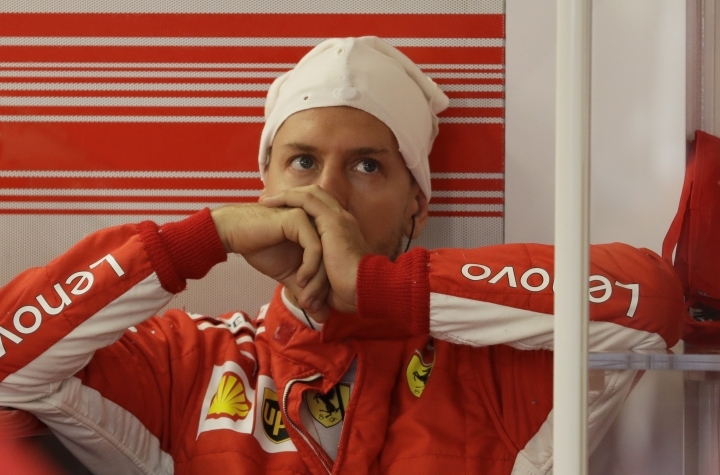 "It will be an intense race," Vettel said. "Anything can happen, safety cars are very, very likely." 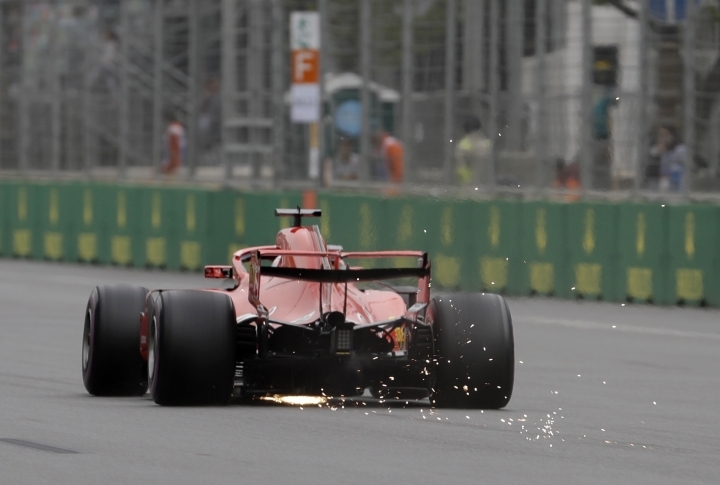 Vettel was issued a penalty for dangerous driving in Azerbaijan last year after hitting Hamilton twice behind the safety car, angered by what he saw as dangerous maneuvers from the British driver. 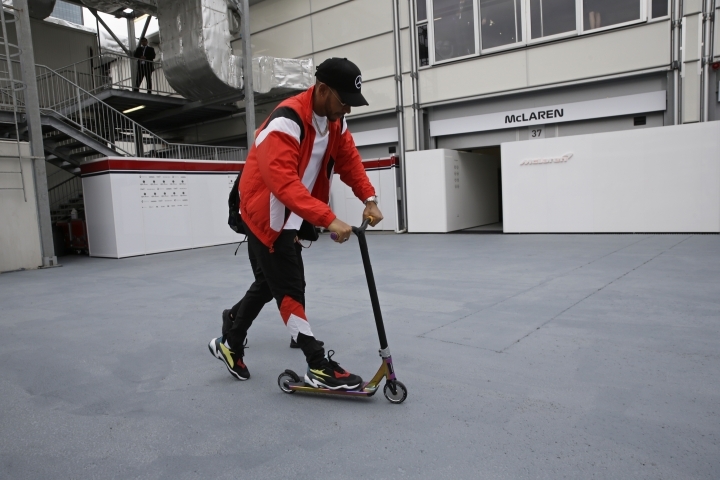 Hamilton promised another tough race on Sunday. "We did the best job we could. 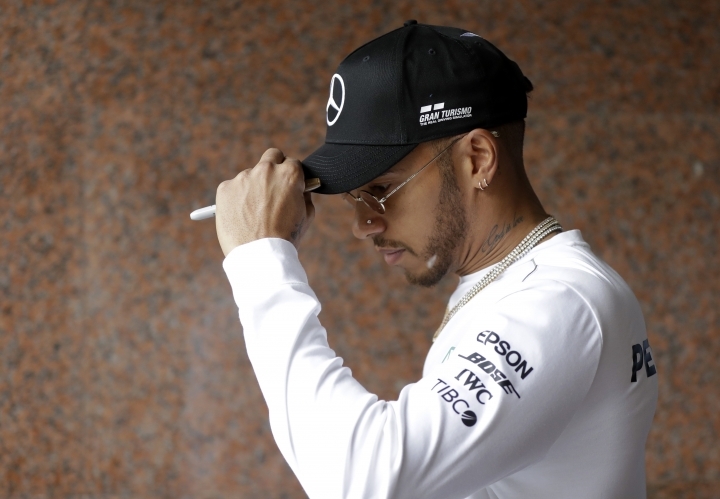 It was very, very close," Hamilton said after qualifying. "We're going to try to give Sebastian a hard time tomorrow." He has historically been unlucky in Azerbaijan, finishing fifth in both previous races after collisions and car problems. Hamilton's Mercedes teammate, Valtteri Bottas, was third, 0.160 seconds behind Hamilton. Red Bull's Daniel Ricciardo was fourth after barely scraping into the top-10 shootout. Ricciardo won the last race in China, and won last year's crash-packed race in Baku. He's said he could leave Red Bull next season if Mercedes or Ferrari offer a more competitive car. If Ricciardo wins Sunday's race, it would be the first time since 2014 that the Australian has more than one victory in a season. 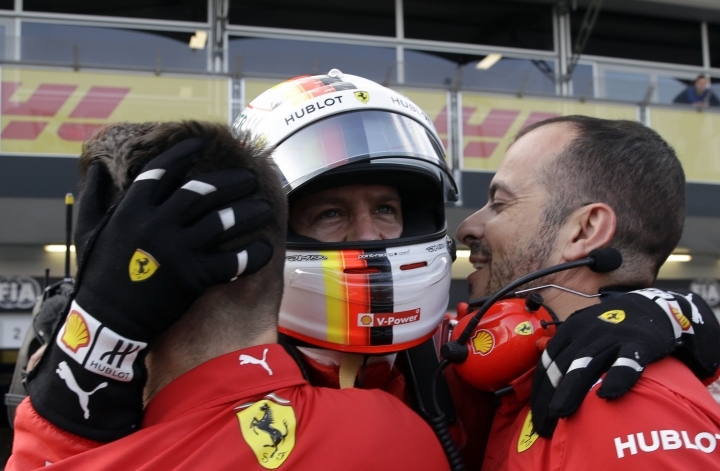 In another indication of Ferrari's unbeatable qualifying pace, Vettel's teammate, Kimi Raikkonen, was heading for pole position after the first two sectors until he slid the car. He qualified sixth, one place behind the second Red Bull of Max Verstappen. Toro Rosso's Pierre Gasly almost smashed into his teammate Brendon Hartley in the first session when Hartley was driving slowly due to a puncture. Gasly had to go into a runoff area to avoid a collision, ruining his lap. "This is unacceptable," Gasly shouted over team radio, while Hartley apologized for getting in his teammate's way, saying he felt "pretty stupid." The drivers collided at the last race in China. Romain Grosjean qualified last for Haas after sliding off the track and stalling, meaning he failed to set a time.